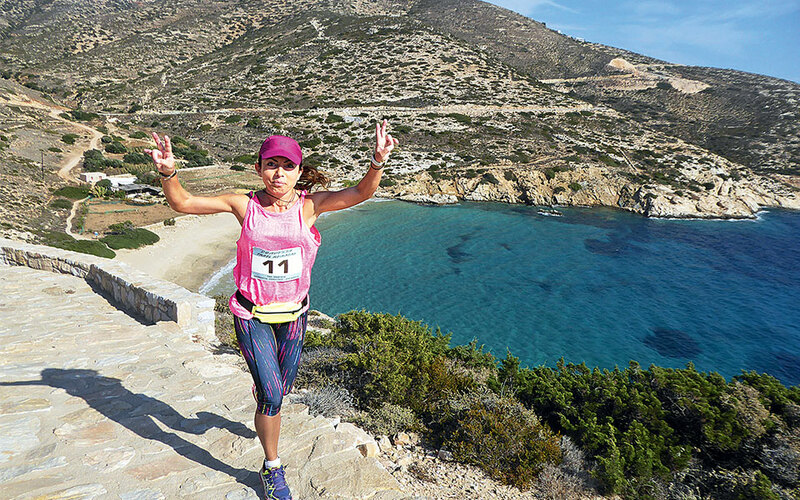 Its growing popularity and initiatives like the Donoussa Trail Running event have put this small Cycladic island on the map of autumn destinations. 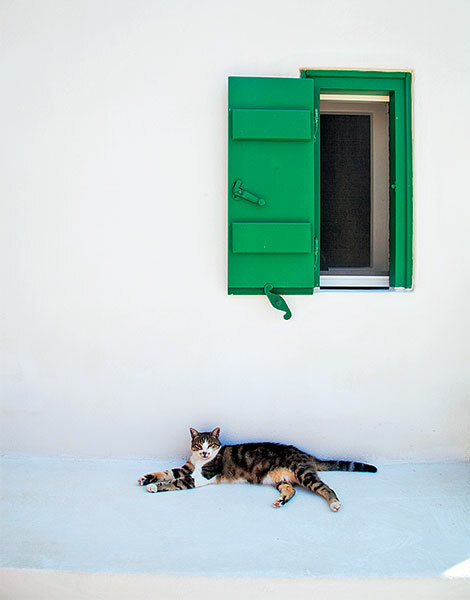 So the tiny Cycladic island of Donoussa, too, has become fashionable. This summer more than 12,000 travelers disembarked at the small port of Stavros. 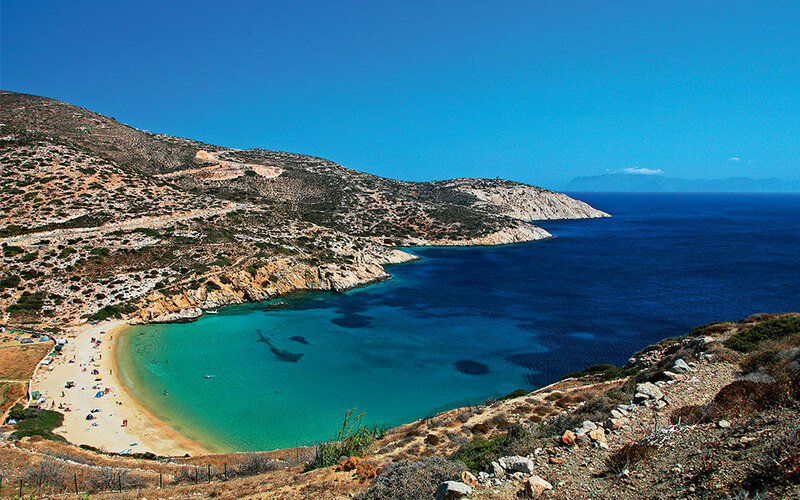 With a population of fewer than 150 residents, only three easily accessible beaches (Stavros, Kedros and Kalotaritissa) and effectively only one developed village – the port of Stavros – it is easy to see that, with numbers like these, the island was inundated. August is no longer a good month to fully appreciate what Donoussa is all about. The other months are. Even as September rolls around visitors continue to make it to this small, out-of-the-way island. Most of them are hikers from abroad, and longtime visitors who know that this time of year suits the island better. This is the month of quiet, enjoyable walks without the searing temperatures of the high summer, and swims in waters as calm as a swimming pool after the summer meltemi winds have abated. There are also two panigyris (traditional festivals): that of Stavros at the port and of Aghia Sophia in the village of Mersini; these are the favourite such events for the locals as they mark the end of a long, tiring summer, bringing the season to a close on a celebratory note. 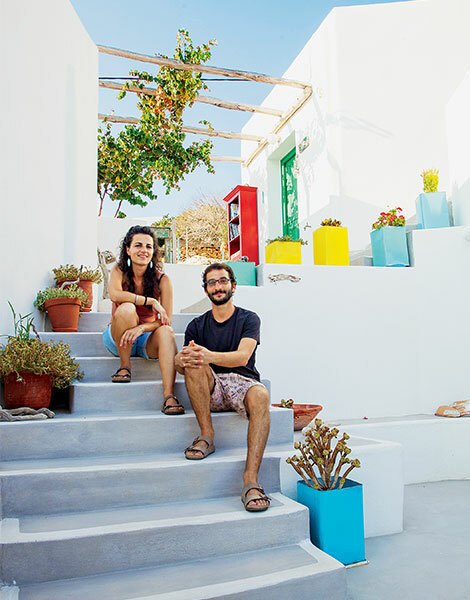 Ploumitsa and Ilias were among the first of the new wave of young people who settled on the island, moving permanently in 2012. The residents, whose number triples in the summer months, typically depart after the panigyris – that is the milestone. But in recent years more and more are staying behind: young people who left to study and have now returned, others who leave for just a few months in the winter, like in all of the Greek islands, and others with deep roots on the island – or no roots at all – and who decided to stay here permanently, to invest in the land and to enjoy a healthier lifestyle on this off-the-beaten-path destination. Among the latter group, with an impressive commitment to island life, is Dimos Doumouras and his partner Jitka Ligosova from the Czech Republic, and their 13-year-old daughter Sarlotte. They were among the first of the new wave to move permanently to the island eight years ago. Ilias Prasinos and his partner, Ploumitsa Faratzi have been living here since 2012. Among the more recent arrivals on the island without a return ticket are Giorgos Doumouras and Evdokia Faratzi who will soon be increasing the island’s population by one, given that they are expecting a child. From left to right: Dimos, Jitka, Evdokia and Giorgos are building a life on this out-of-the-way island. Beginning last year, the Doumourases and Jitka now run the exceptional restaurant, Avli, the best currently on the island and one which has raised the bar impressively. Ilias and Ploumitsa run the unique guesthouse, Argalios, (meaning Loom) the only organized lodging that stays open all year round. Ploumitsa also gives lessons on traditional weaving while Ilias, together with his brothers Vasilis and Michalis, have worked for many years at the café-bar-restaurant on Kedros Beach. They are among the group of people who experience Donoussa’s magical landscape in the winter as well the summer, and watch the enchanting changing of the seasons, as Dimos Doumouras puts it. 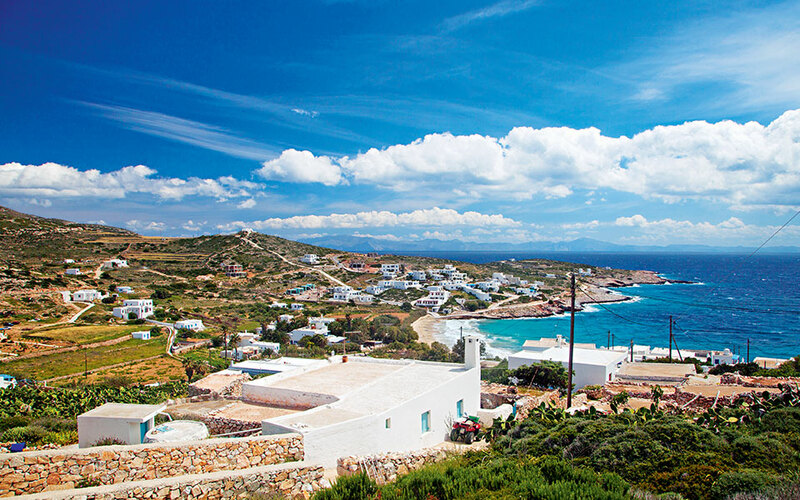 Over the past five years they have resurrected the Poseidon Cultural and Environmental Association of Donoussa, and through it promote a sense of community and a model of development that respects the island’s landscape and its people. Such things cannot be taken for granted on such a small island with residents who, out of ignorance, can damage its unique character. A view of Stavros, the main village and port of Donoussa. 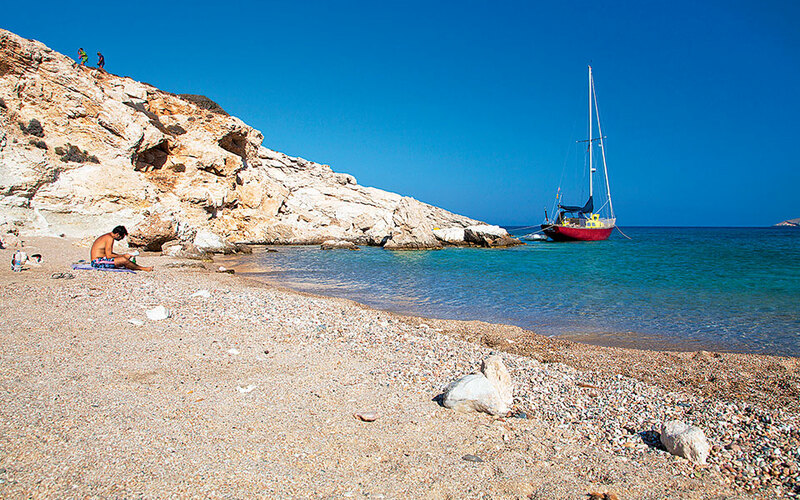 Final swims at Mesa Ammos, the main beach of Kalotaritissa. 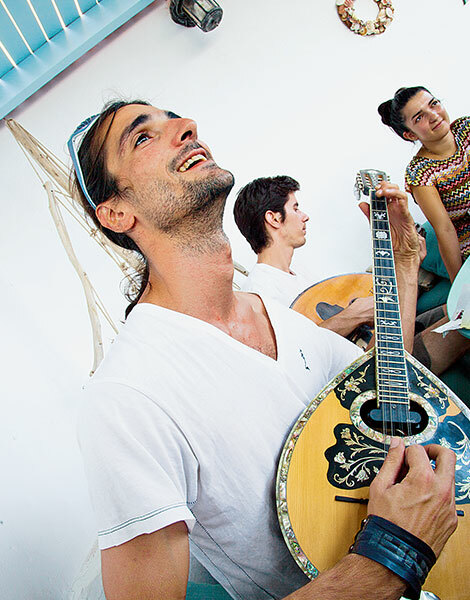 Cleaning beaches and trails with volunteers from all over Greece, a ping pong tournament, movie screenings and traditional dance lessons are just a few of the activities that are held throughout the year. This year, on 27-28 September, the association will be running a two-day event focused on fairy tales, with stories told accompanied by the lute, stories for adults, workshops for kids and a masterclass in creating fairy tales by the team of Paramythia Zo. But the pinnacle of the group’s efforts is Donoussa Trail Running – a race that sees trail runners cross the length and breadth of the island, and which will be held for the second year on October 20th, bringing participants from all around Greece to the island in the heart of autumn. At the inaugural Donoussa Trail Running event. In 2006, the year that I first set foot on Donoussa, about a total of 30 people would disembark from the boat in August. The goat trails – which were used by the locals until the 1990s when the first and only 12 km road was created – were uneven and difficult to make out. There wasn’t even a map of the island then; to reach the peak of Papas, the highest point on the island at 385m, and the lighthouse of Kalotaritissa, I would step uncertainly over stones and boulders, while the locals back in the village counted the hours – if I took too long they would search for me at the base of the cliffs, they would say. My only points of reference were the handmade signs and the hand-drawn map which had been made by Eirini Lalaki, a remarkable artist from Thessaloniki who then lived on Donoussa permanently, and laid the first foundations for the development of hiking tourism on the island. Happily, her work has been continued by the young people who now hold key positions in the Cultural and Environmental Association. You will come across both planned and impromptu music events in the summer. All of those routes under the dazzling Cycladic sun, over hills fragrant with thyme and summer savory, the wind blowing and the sea glittering in the background – all those things that have caused many to fall in love with this unique island – have now been cleared, signposted and linked up with one another. They form the 13 km of the organized hiking trails which athletes compete on during the Donoussa Trail Running event. The event is organized by the Cultural and Environmental Association, the Region of the South Aegean, and the Association of Donoussans of the Cyclades, with the support of the local municipality and local business association. A large number of volunteers also assist with the event – everyone on the island contributes what they can. “The idea came from Giannis Panourgias from Amfikleia on Mount Parnassos who had designed [the trail running event] Monopati Parnassou. He came to the island, hiked along the paths and proposed that we link them up and create the race. The goal for this winter is for our trails to be included in the national registry of trails so that we can obtain European certification. It is very nice for people to come outside of the summer. 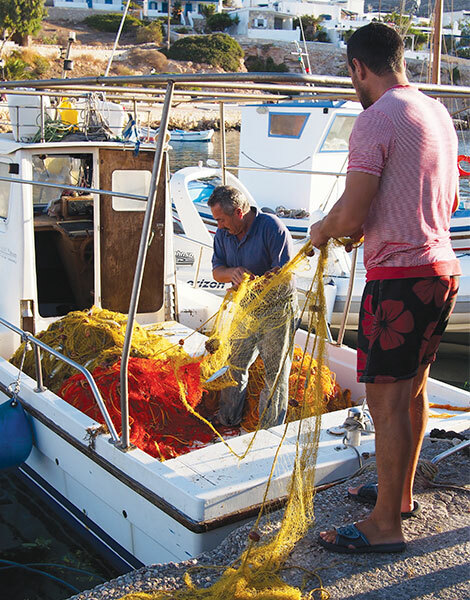 The issue, in any case, is for the island to stay alive all through the year, for the kids of Donoussa to have a reason to stay here,” Ilias Prasinos tells me, who is the president of the association. The 13 km network of hiking trails on Donoussa is maintained by locals throughout the year. Registration for the race is open until October 12 and the cost of participation is 10 euros. The race will start on Saturday 20/10 at 10 am. The route is 19km long, running effectively around the island and passing through its four settlements (Stavros, Messaria, Mersini and Kalotaritissa) and covering an elevation differential of 1000m. Runners encounter all kings of terrain, from steep, rocky paths to asphalt and sandy stretches. 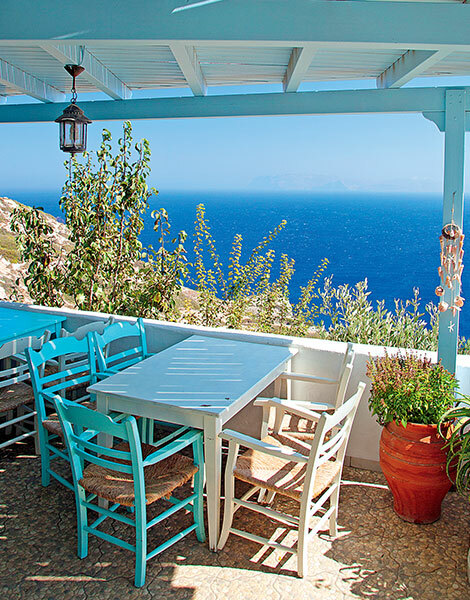 The Aegean is visible at all points as one runs through the Cycladic landscape with its low vegetation, prickly pears and dry stone walls. The wild, rocky northern side is stunning, while the magical beaches of the south beckon like sirens, distracting you from the final goal of finishing – particularly if you are just a recreational runner. That is okay too. Simply participating with likeminded individuals in the celebration of Donoussa’s trails this autumn will offer far greater satisfaction than any trophy ever could. With the local ferry Express Skopelitis which links Naxos with the Lesser Cyclades and Amorgos every Monday, Wednesday and Saturday at 14.00. On Friday 19/10 there will be an extra voyage undertaken by Skopelitis for the participants in the race Donoussa Trail Running, while Blue Star has announced an extra return voyage for athletes and visitors to Piraeus on Sunday 21/10 as well as 50% off for travelers taking part in the event. Until after the weekend of the Donoussa Trail Run you will find many guesthouses still open, including Argalios Guest House (tel. (+30) 22850-79008) from €25, Makares Apartments (tel. (+30) 22850-79079) from €35, Donoussa Rooms (tel. (+30) 22850-51575) from €20. To eat, tavernas that will be open include Captain Giorgis, tel. (+30) 22850-51867), the restaurant / pizzeria Ambelaki (tel. (+30) 22850-79039) and the café-bar Skantzohiros (tel. (+30) 22850-51880).